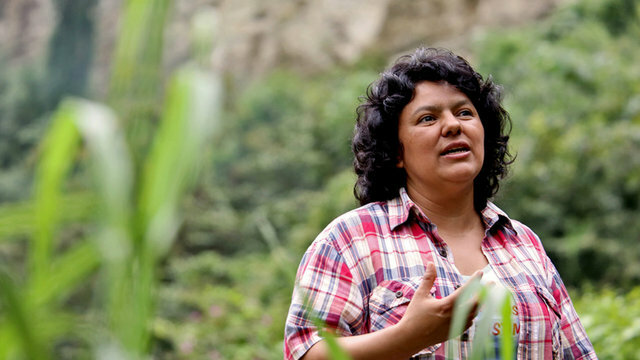 Since the 2009 military coup, that was carried out by graduates of the U.S. Army School of the Americas, Honduras has witnessed an explosive growth in environmentally destructive megaprojects that would displace indigenous communities. Almost 30 percent of the country’s land was earmarked for mining concessions, creating a demand for cheap energy to power future mining operations. To meet this need, the government approved hundreds of dam projects around the country, privatizing rivers, land, and uprooting communities. Repression of social movements and targeted assassinations are rampant. Honduras has the world’s highest murder rate. Honduran human rights organizations report there have been over 10,000 human rights violations by state security forces and impunity is the norm – most murders go unpunished. The Associated Press has repeatedly exposed ties between the Honduran police and death squads, while U.S. military training and aid for the Honduran security forces continues. SOA Watch is an independent organization that seeks to close the US Army School of the Americas, under whatever name it is called, through vigils and fasts, demonstrations and nonviolent protest, as well as media and legislative work. Read other articles by SOA Watch. This article was posted on Thursday, March 3rd, 2016 at 7:56am and is filed under Activism, Assassinations, CIA, Environment, Honduras, NSA.